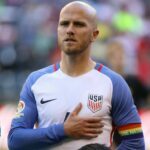 Michael Bradley opened the scoring in the U.S.’s friendly against Panama in spectacular fashion by scoring an Olimpico in the 27th minute. The Toronto FC midfielder placed a perfect ball into the far corner of the net, in between the Panama keeper, a defender and teammate Jozy Altidore. Clint Dempsey went on to make it 2–0 in the 37th minute off an excellent pass from Gyasi Zardes. And with that, the “JK OUT” banner hung in the stadium was probably rolled up quietly and put away for another day.